THOMASVILLE, GA. -— Former Atlanta Braves pitcher, John Smoltz, has been named the guest speaker Nov. 13, at the Fellowship for Christian Athletes’ annual banquet. The banquet will be at the Thomas County Central middle school cafeteria with dinner served at 6 p.m. and the program at 7 p.m. Source: TimesEnterprise.com. 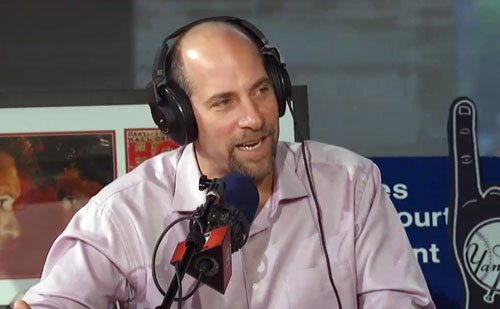 Photo shows John Smoltz from a 2014 interview with Dan Patrick. Massey said he didn’t know exactly what the MVP winner will be speaking about. Massey will give a brief intro about what the FCA has done recently, then completely hand over the reigns to Smoltz. “I’ve heard he’s such a good speaker, that, just, get out of his way,” Massey said. “So that’s what we’re going to do.” The former Cy Young Award winner will most likely share baseball stories and faith experiences as he has done so often at past speaker events. Smoltz is the only pitcher in Major League history to top both 200 wins and 150 saves. He became the 16th member of the 3,000 strikeout club on April 22, 2008 when he fanned Felipe Lopez of the Washington Nationals in the third inning in Atlanta. He is a born-again Christian who has made Atlanta his home, and is Chairman of the Board at Alpharetta-based King’s Ridge Christian School, and a member of the Presbyterian Church in America. Christian Speakers 360 is a booking agent for Christian athletes and celebrities. If you would like to book John Smoltz for a personal appearance, contact John Smoltz’s booking agent for speaker fees at 1.800.966.1380.